Instead of looking back over a specific gaming franchise, this time I thought I’d look back at one of my favourite gaming developers of the 80’s…Cinemaware. Cinemaware was the brainchild of Bob and Phyllis Jacob and founded in 1985. Bob Jacob was a bit of a movie buff and wanted to bring a cinematic style to computer software, hence Cinemaware. Being inspired by classic cinema, Cinemaware games were often based on a specific genre or style with games inspired by World War I movies, 1950’s B-movies, 1930’s mob movies and many other golden era movies. But later in their reign, Cinemaware even delved into sports titles but still added that Cinemaware style and atmosphere. Unfortunately, Cinemaware were declared bankrupt in 1991. Yet in 2000 the company was resurrected by Lars Fuhrken-Batista who bought the Cinemaware trademark and all associated IPs and rebranded it as Cinemaware Inc.
Cinemaware Inc. started to develop remakes of its popular past titles. Digitally remastered and updated for Microsoft Windows and the Apple Macintosh. The games feature the same gameplay as the originals, but with updated/improved graphics and audio. Cinemaware Inc. also ported some of their older games to handheld systems, such as the Game Boy Advance. In 2005 Cinemaware Inc. was acquired by game publisher eGames, and Lars Fuhrken-Batista became Vice President of Development. Soon afterwards eGames announced the launch of Cinemaware Marquee, a publishing label to be used to bring new games to the U.S. market. Then in 2007, eGames released an Adobe Flash version of Defender of the Crown for download via their website, entitled Defender of the Crown: Heroes Live Forever. So technically, Cinemaware are still going today. There are even remasters and ports of classic Cinemaware games showing up on Android and IOS. But I’m not here to talk about the “new” Cinemaware, I’m here to talk about the classic and original Cinemaware from 1985-1991. So please sit back and join me on my retrospective look at probably the first ever gaming company that melded cinema and games…and often really well too. 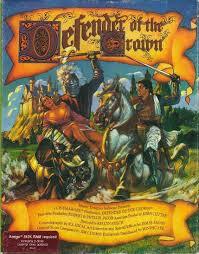 Defender of the Crown: Was the first title released by Cinemaware. Originally released for the Commodore Amiga in 1986, Defender of the Crown was a meeting of strategy, action and resource management. Being based on swashbuckling movies like Robin Hood. You chose from one of four characters to play as: Wilfred of Ivanhoe, Cedric of Rotherwood, Geoffrey Longsword or Wolfric the Wild. Once you have selected your character, you are tasked to take control of England by fighting off Norman hordes. The player must eventually fight for control of all territories in England. While playing you must amass armies and fight for control of your opponents castles. Along the way you will engage enemy armies via battle, looting or even lay siege to opposing castles. Territories could also be won in jousting contests. Occasionally you may get a request to rescue a damsel in distress and you can even ask for help from the legendary bandit; Robin Hood. Defender of the Crown was a wonderfully crafted gaming experience that melded various gameplay mechanics and elements really well, all while paying homage to classic swashbuckling, Errol Flynn styled films. What was most striking were the amazing graphics at the time and many game reviewers would often praise them endlessly. The moody castle interior when raiding/rescuing a damsel in distress, the almost “real” look to the characters portraits. The game was just simply beautiful to look at and really showcased what the Commodore Amiga could do. Everything just looked and felt so…cinematic. This was our first taste of Cinemaware and their style, but there was much more to come. While this was the first title from Cinemaware and was far from perfect, it certainly set a high bar for others to follow, even for Cinemaware themselves. 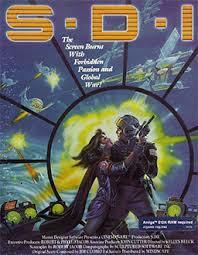 S.D.I: S.D.I (Strategic Defense Initiative) was Cinemaware’s follow up to Defender of the Crown and released in 1986 for the Commodore Amiga. Taking inspiration from cold war styled movies and even classic James Bond movies, while using Ronald Reagan’s proposed and controversial Strategic Defense Initiative as a plot device all set in a universe when the Soviet Union did not collapse. You play as General Sloan McCormick of the United States Air Force, commander-in-chief of the American SDI system. McCormick’s headquarters are in the American space station, which monitors a network of anti-missile satellites which are in geosynchronous orbit over the United States. The Russian revolutionary extremists, led by discontented members of the KGB have gained control of several ICBMs along with space launch facilities needed for deploying manned orbital fighters. As the revolutionary extremists have received no response to their demands for the Kremlin to surrender or for the Americans to abandon their SDI system, these revolutionaries begin using their seized assets to launch fighters against both the American and Russian space stations. They have also begun to fire waves of nuclear missiles at the United States. The player must engage the enemy projectiles and enemy ships using a space-based fighter. You are tasked to destroy the incoming missiles otherwise they wreak destruction upon American soil. The player must also make repairs to the defense satellites that will become damaged during the battles. During the latter part of the game, McCormick must make a desperate attempt to rescue his lover Natalia “Talia” Kazarian who is the Soviet station commander, who is placed in grave danger because her station is eventually boarded by the enemy forces. So McCormack must attempt to fight his way past them and reach Kazarian before she is tortured and killed. While your mission is to save Natalia, you do not necessarily have to succeed. S.D.I met with mixed reviews with many commenting on the repetitive gameplay but praising it’s cinematic feel and tone along with the emotionally laden ending. From the cold war inspired, space themed S.D.I. Cinemaware would next take us to the gritty streets of Chicago for their 3rd game. 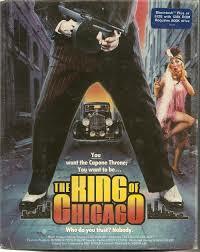 The King of Chicago: This was Cinemware’s take on classic Hollywood mobster movies. Released in 1986, the game gave the player the chance to make your way up in the criminal underworld trying to become the next Al Capone. Playing as “Pinky” Callahan and starting with a small mafia mob, you try to take over Chicago after Al Capone is sent to jail. The goal of the game is to increase the size of your gang in order to take over all mobster activity in the city. But you are given a set time to complete this task in order to be included in the formation of the New York syndicate. The game features various mobster activities such as illegal gambling, bombings, drive-by shootings and even bribing of corrupt government officials. The player must out deal and even murder opponents in order to win control of each area of the city until you become King of Chicago. You’ll also have to stay one step ahead of the law and even keep your girlfriend, Lola happy by catering to her whims and desires at the risk losing her or even having her betray you. The game was quite revolutionary as it offered a fairly open style of game and even different endings. The game would randomly load up at a start point so everytime you played, you could start it differently. Along with this feature was ability to make open decisions that would lead to differing cut scenes, scenarios and even endings depending on how you treated certain characters or how you handled situations. Leaving the game with plenty of replayability as the various decisions had multiple outcomes and depending on not only what you do, but also how you do it would lead to many varying outcomes. An early example of interactive movies…done right. The King of Chicago pleased many reviewers at the time with it’s true cinematic style and impressive multilayered gameplay. Cinemaware would find inspiration from a much more mythical source for the next game. Sinbad and the Throne of the Falcon: 1987 saw the release of Sinbad and the Throne of the Falcon. Cinemaware took inspiration from the Sinbad films made throughout the 1930s and 1940s, Arabian nights movies and even classics like Jason and the Argonauts. Using a fantastical Arabian Nights-esque world as it’s backdrop. With you playing as Sinbad the Sailor who is commissioned by The Princess to rid the land of the Dark Prince. Gameplay used an open world map for orientation and dialogue sections where the player would engage other characters and further conversations, relationships and scenarios. Where the choices you make would alter the outcome of the game. Utilising the world map you were free to sail to any location which would trigger a dialogue or action sequence. In cities you could hire men to add to your crew. While in the deep forests, you could talk with shamans and Gypsies about magic and potions. The action sequences were split into four main scenarios. Shipwrecks: Finding pieces of a broken ship in rough waters, you must steer the ship through the waves. trying to avoid rocks and picking up drowning sailors who would eventually join your crew. A Cyclops: When in remote areas you could stumble upon a Cyclops who will raid your camp and steal away some of your crew. Armed with a slingshot you would have to blind the Cyclops by hitting his eye while avoiding the rocks thrown at you. The Earthquake: When Sinbad falls into an opening chasm in the earth, you must escape in a platform-esque sequence climbing back to the top. Sword Fighting: After the “Pick Up Thy Joystick!” on-screen prompt pops up. Sinbad does swordplay battle with stone idols that have come to life, Pirates, wild animals that attack your campsite and the even Black Prince himself. 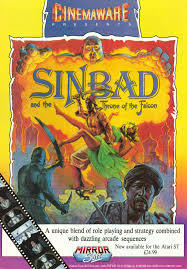 The reviews of Sinbad and the Throne of the Falcon were middling to fair at the time, with most reviewers commenting on how the various game modes never really gelled as well as they did with Defender of the Crown previously. But they praised the graphics, audio and open world idea as Cinemaware once again managed to recreate classic cinema in game form. Cinemaware have taken us to medieval England, Space, 1930’s Chicago and even on an Arabian nights adventure. But their next game would put us in the role of three of the greatest slapstick comedians ever to grace the big screen. 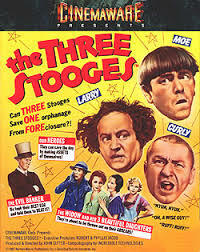 The Three Stooges: Released in 1987 and taking inspiration from several of The Three Stooges short films. The game had you playing as the Stooges in various mini games based on their films in order to raise money to save an old orphanage from closing down, all set to a 30 (in game) day time frame. You would select one of the mini games by pressing the button while a hand randomly flashed over various symbols. Some symbols would offer static rewards such as adding to your money total, or hitting one of the mini games would take you to the event such as the boxing contest (based on the Punch Drunks short) or a cracker eating contest (based on the Dutiful But Dumb short) and various other mini games like pie throwing and a hospital chase. The game was loaded with classic humor right from the start as the Defender of the Crown (Cinemaware’s first title) loading screen pops up, complete with the music. Then the game versions of the Stooges walked onto the screen as the music screeches to a halt and Curly says: “Hey fellas! We’re in the wrong game!”. Larry replies with: “This looks like a kids game!” and Moe says: “You imbeciles!”, and smacks Curly. They then walk off and into their game. The game met with very mixed reviews. While the graphics and presentation were always praised, especially the many sound bites taken directly from the Three Stooges films, the rather basic and dull gameplay was not favoured as we had seen far better games from Cinemaware in the past. Brilliantly presented with the game looking and feeling like The Three Stooges, but sadly the gameplay was thin on the ground and very repetitive. This entry was posted in LBoG: Retrospectives and tagged Cinemaware, Commodore Amiga, Defender of the crown, Game retrospectives, Little bits of gaming, retro gaming, Retro gaming blog, S.D.I, Sinbad and the Throne of the Falcon:, The King of Chicago, The Three Stooges on 06/05/2015 by Steve Perrin.